As the pace of business continues to accelerate, forward-looking organizations are beginning to realize that it is not enough to analyze their data; they must also take action on it. To do this, more businesses are beginning to systematically operationalize their analytics as part of a business process. 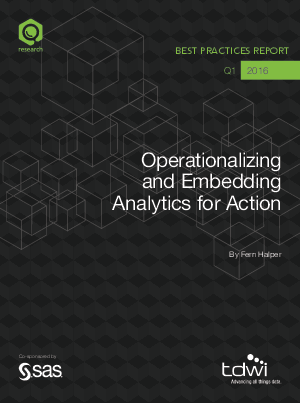 Operationalizing and embedding analytics is about integrating actionable insights into systems and business processes used to make decisions. These systems might be automated or provide manual, actionable insights. Analytics are currently being embedded into dashboards, applications, devices, systems, and databases. Examples run from simple to complex and organizations are at different stages of operational deployment. Newer examples of operational analytics include support for logistics, customer call centers, fraud detection, and recommendation engines to name just a few. Embedding analytics is certainly not new but has been gaining more attention recently as data volumes and the frequency of data continue to increase. Companies realize that making analytics programmatic by automating operational decisions can be beneficial to both the top and bottom line. Another big advantage of operationalizing analytics is that it makes it more consumable. Consumability has become a hot topic because it makes analytics available to a wider group of people than simply those who analyze data or develop models and share it with a select few. As more people use analytic output, its value increases.